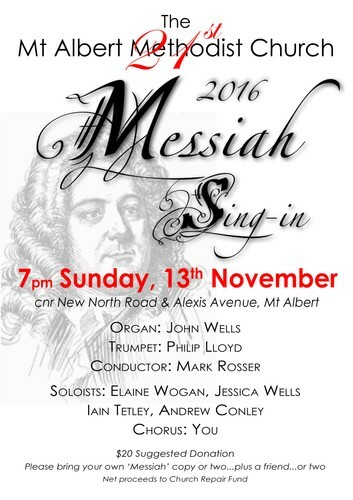 Come and join 250 other singers in this the 21st Mount Albert Methodist Messiah Sing-in! It will be special this year to be part of 150 years celebration of Methodism on this site. You can read the history of this in "Mount Albert then and now" the beautiful book by Debbie Dunsford for the Mt Albert Historical Society. It will be on sale.